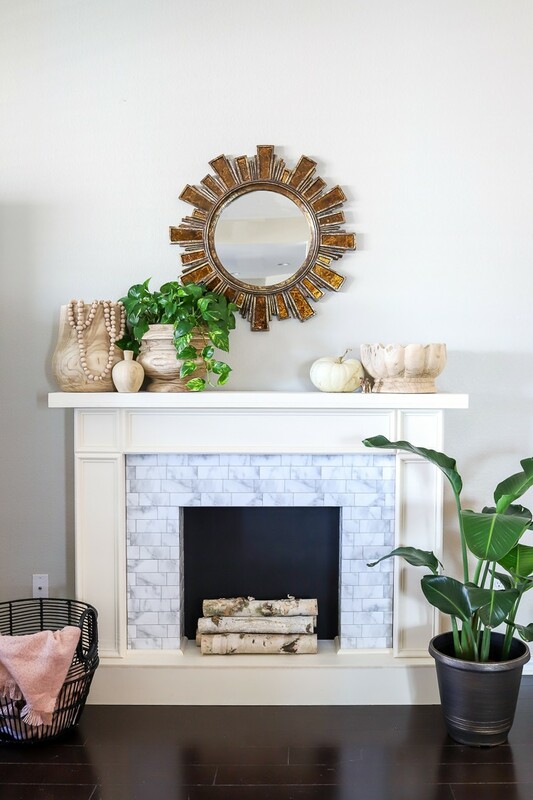 This DIY faux fireplace is beautiful and renter friendly! Jen Woodhouse, of The House of Wood, transformed her living room by adding a fireplace. 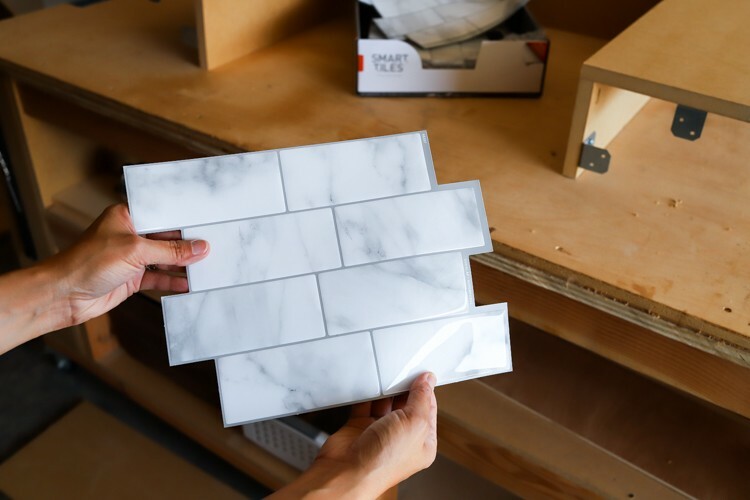 Using Smart Tiles, Jen was able to create a the perfect look in no time. 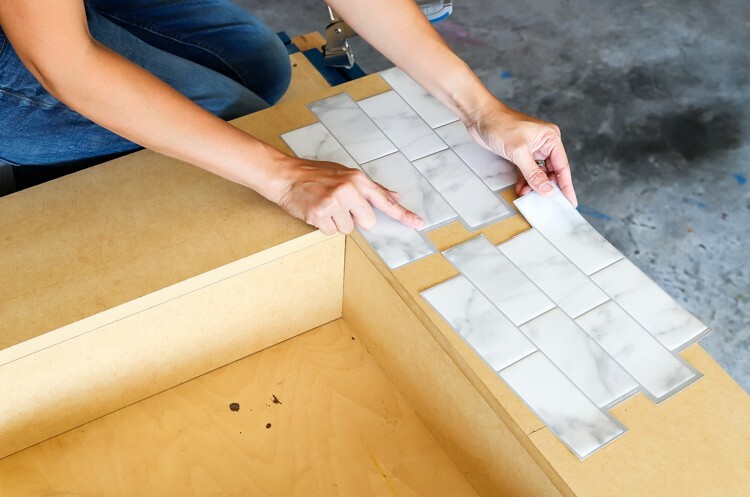 Read on to find out how you can use peel and stick tiles in your home. Need a place to hang your holiday stockings but don’t have a fireplace? No problem! 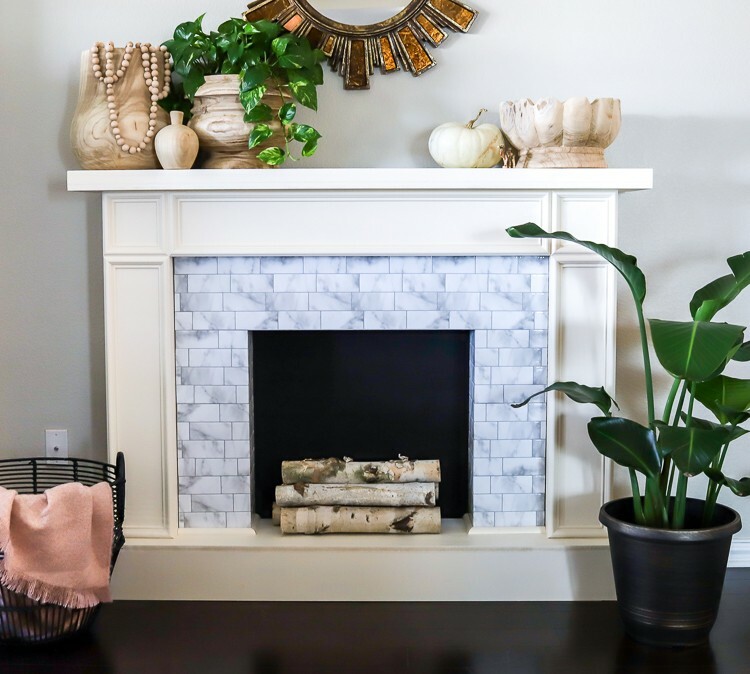 Build this beautiful renter-friendly DIY faux fireplace and use Smart Tiles for the easiest tiling job ever. 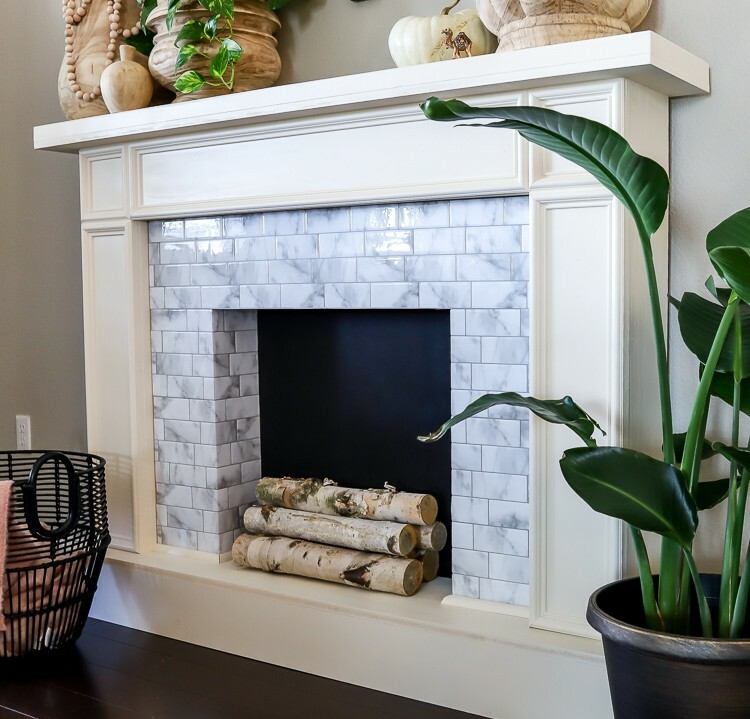 The peel-and-stick tiles add a realistic and elegant touch – a faux fireplace never looked so real! 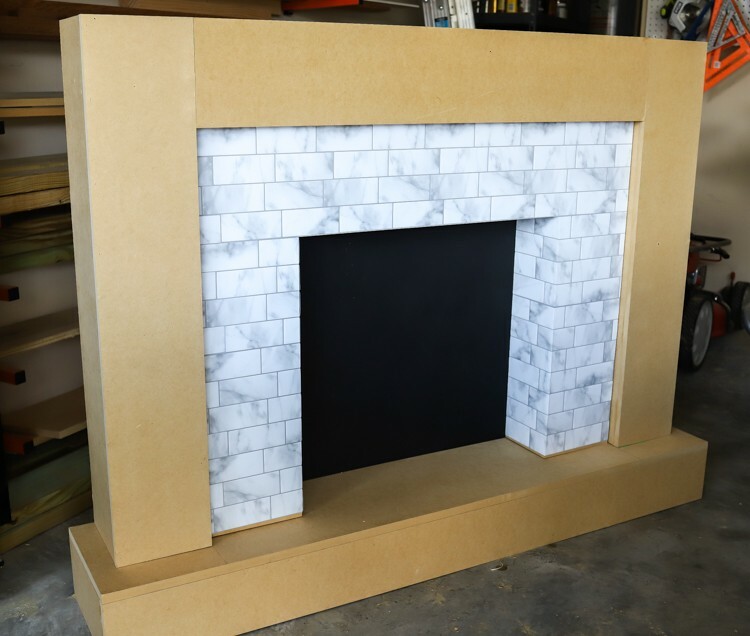 You can either build this DIY faux fireplace out of sheet goods (I chose MDF) or you can use dimensional lumber. The choice is yours; I drew up the plans so that you can do either. For exact dimensions and 3D diagrams, download the building plans here. Drill ¾ in. 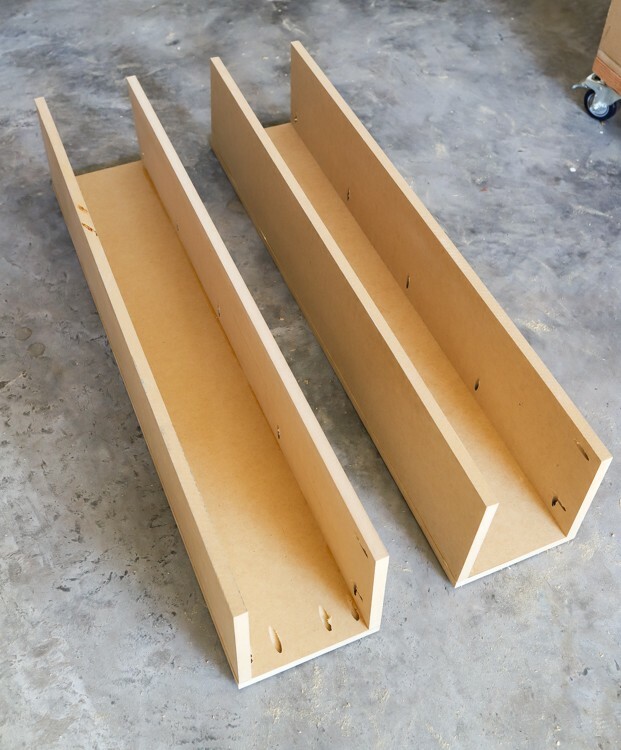 pocket holes as shown and construct the firebox with 1 ¼ in. pocket screws and wood glue. The above photo is the view from the back. Here is the front view of the firebox. This will be the surface where the Smart Tiles will be placed. 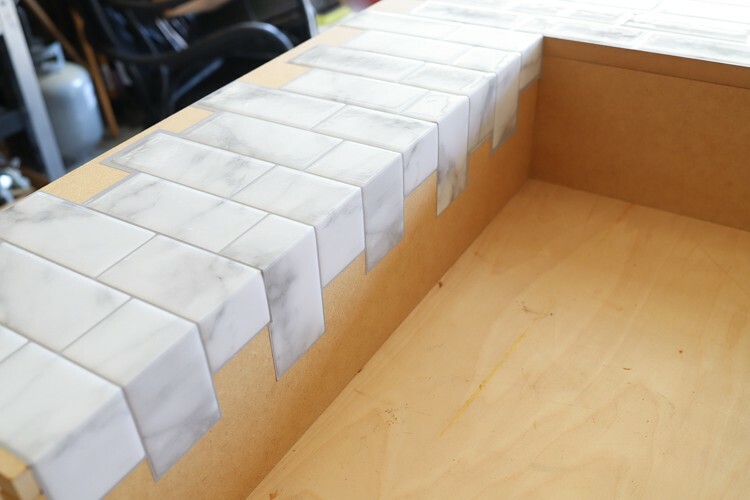 Now it’s time for the fun part: the tiling, but without all the mess! The Smart Tiles came in a neat little package like this. They were thin and flexible, like three-dimensional stickers. I chose the Metro Carrera Tiles. I couldn’t believe how real they looked! 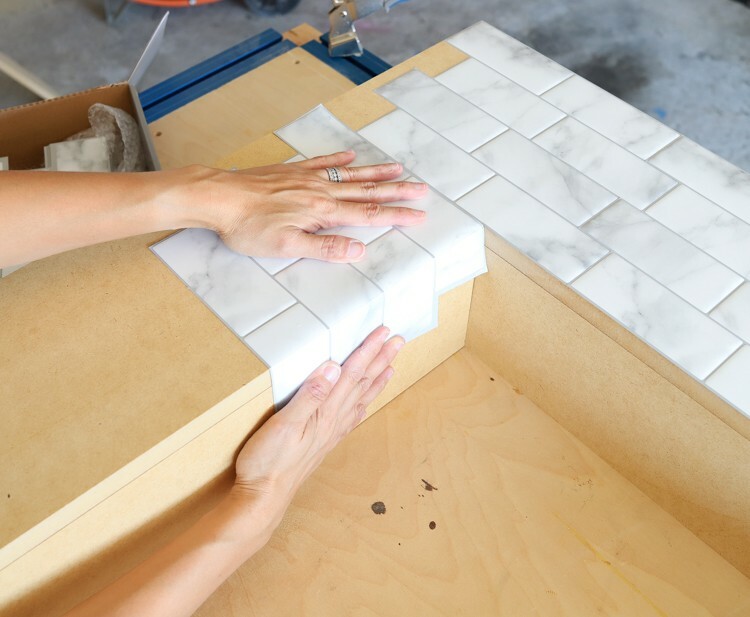 I simply peeled the backing off and pressed the tile into place. Peel and stick – so easy! 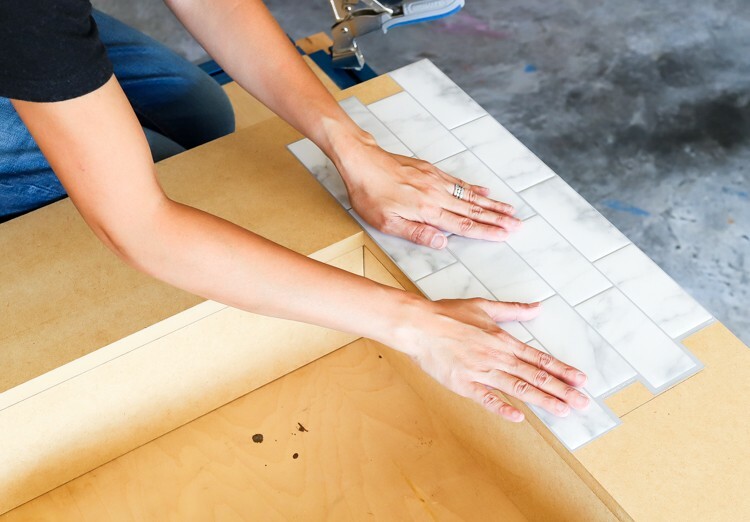 No need for fancy tools or messy grout! 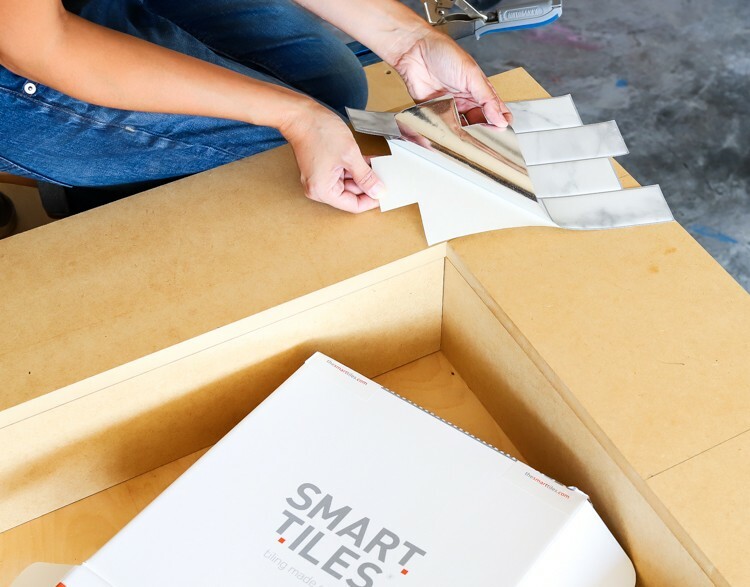 The Smart Tiles come with an overlap edge on one side of the tile sheet. 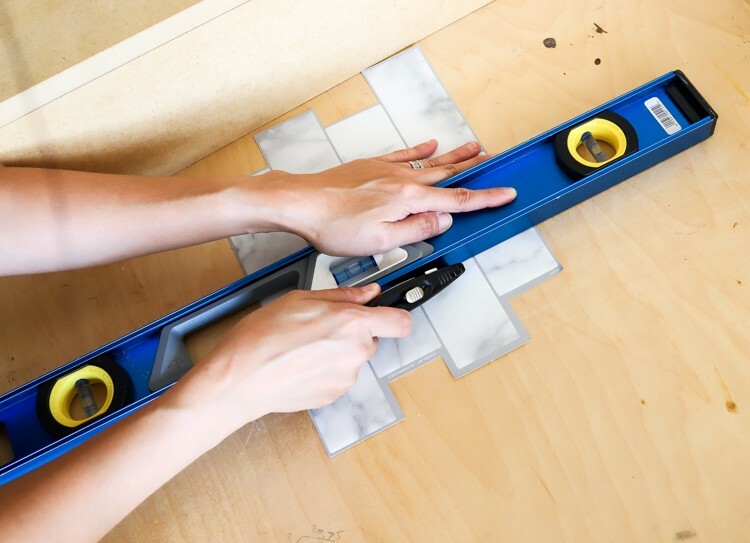 Stick the next tile onto the previous one, covering the overlap edge. Press firmly to adhere. When tiling over a convex corner, I simply marked where the corner would be, then used a box cutter to score a straight line on the tile. Use a straight edge to guide your cut lines. Then I folded the tile where I scored it and simply peeled the backing and stuck it in place. 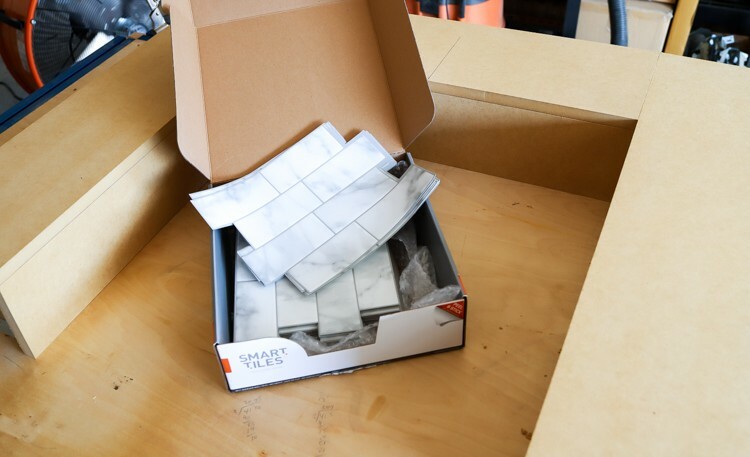 I continued to install the Smart Tiles until the entire surface of the firebox was covered. Soon, I was left with this beautiful thing. So pretty, right? This has been the easiest and fastest tiling job I’ve ever done! 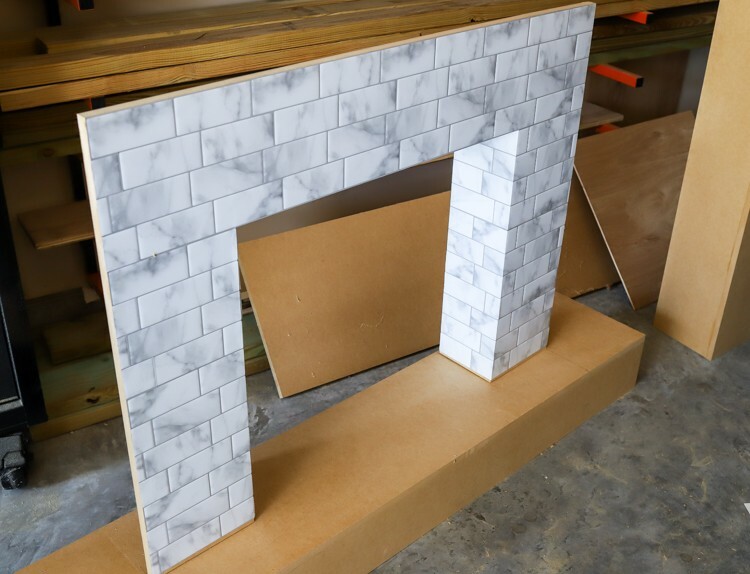 After the Smart Tiles were installed, I finished building the rest of the DIY faux fireplace. 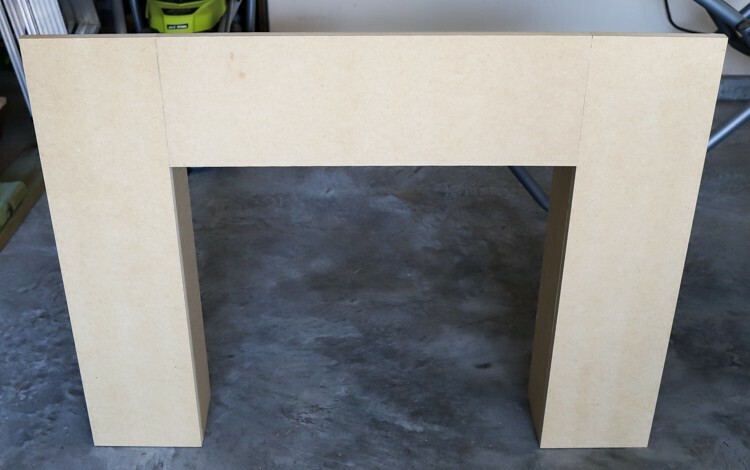 The base of the fireplace is a simple box built from MDF. The next step was to build the pillars and the header. Here are the two pillars. 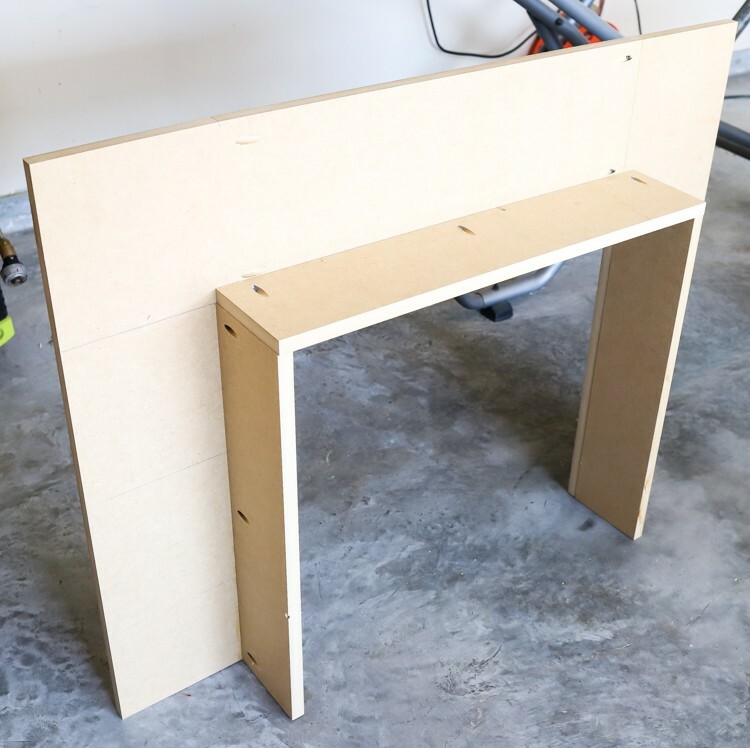 Once again, I used pocket hole joinery here. I painted a scrap sheet of ¼ in. plywood with black chalkboard paint and attached it to the back of the firebox with 1 in. staples and wood glue. It would be so cute to draw a crackling fire and some logs onto that chalkboard, wouldn’t it? Then I dry-fitted the parts to make sure everything fit perfectly and attached the pillars to the base with these Simpson Strong-Tie framing angles. Now it’s time to add the mantel. I placed the mantel on top and attached it to the fireplace with 2 in. countersunk wood screws. 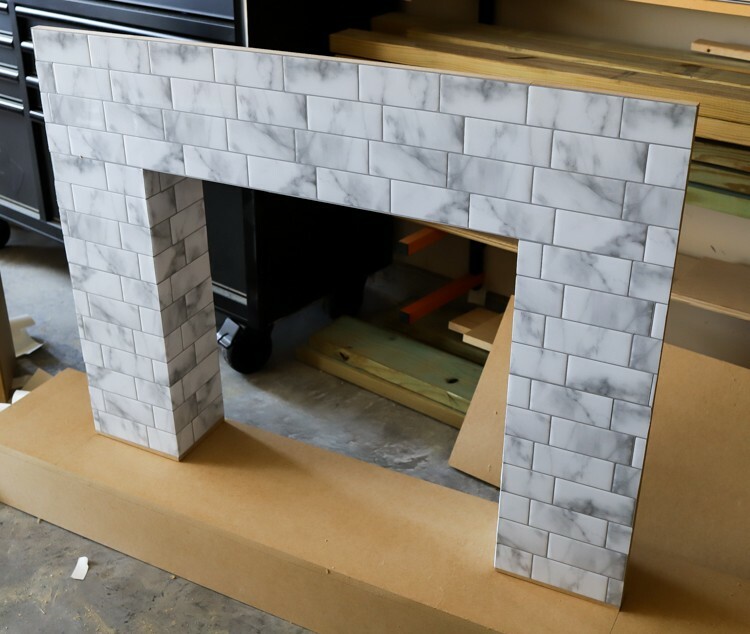 I added the decorative molding to the face of the fireplace with 1 ¼ in. brad nails and wood glue. Finally, before painting the MDF, I removed the tiled firebox and set it aside. Because MDF tends to absorb paint quite a bit, I sprayed a couple of coats of primer before spray-painting it white. Even with the primer, I had to use three coats of spray paint. Once the paint was dry, I added the firebox back in, attaching it to the base with more framing angles. I love how it turned out! 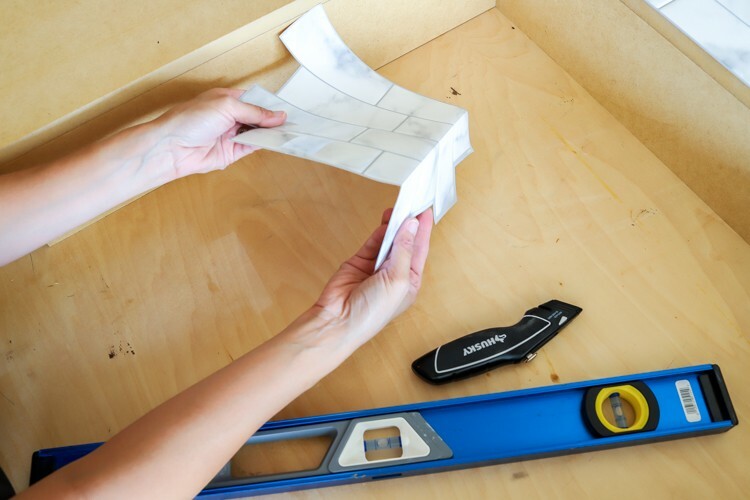 For a more built-in look, you can attach matching baseboards. 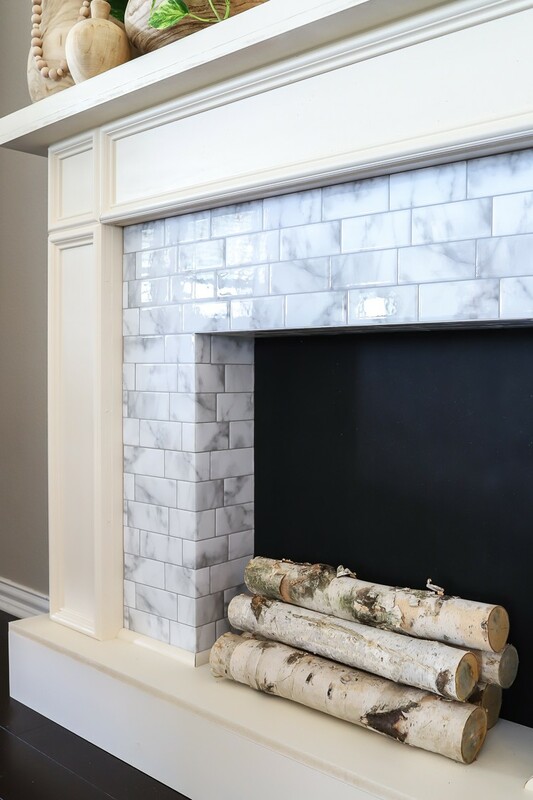 The Smart Tiles add such elegance and class to this DIY faux fireplace and installation was quick and simple. 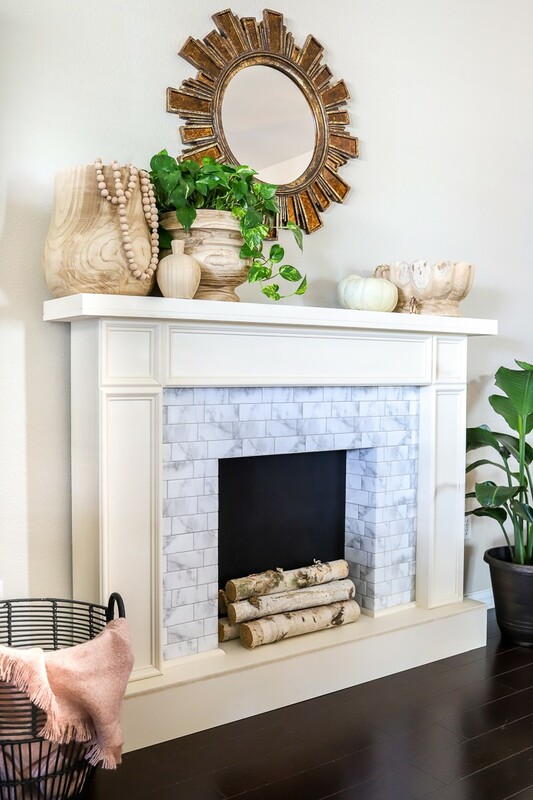 The post Renter-Friendly DIY Faux Fireplace with Smart Tiles appeared first on The Home Depot Blog.